As a collector, you’ve hopefully discovered that Monterey Motorsport Park — located adjacent to the Monterey airport — offers the ideal solution to the challenge of finding a convenient place to securely store your cars, where you can easily enjoy and work on them and share your hobby with other auto enthusiasts. But it’s only natural to want to maximize both the space in your garage-condo and the value of your investment. The answer is single-post lifts such as the ones manufactured and marketed by American Custom Lifts. Now, you can purchase whatever size of unit that meets your budget requirements and still easily fit your cars into your garage-condo. Every unit at Monterey Motorsport Park has an extraordinary amount of vertical space — up to 13 feet under the mezzanine and as high as nearly 25 feet elsewhere. With lifts such as American Custom Lift’s affordable M-1 single-post lifts, you can easily double the number of cars you can fit into a given space. Supports up to 6,500 lbs. 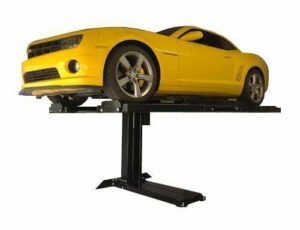 Check out this customer review of an American Custom Lifts, single post car lift. Monterey Motorsport Park offers car collectors and motorsports enthusiasts that rare opportunity to take advantage of a promising investment and be part of something you’re passionate about at the same time. In the past, investments in Monterey Peninsula property have performed very well. And while there can be no guarantees about Monterey Motorsport Park’s future prospects, previous developments such as Garage Unlimited of Monterey have demonstrated strong resale values — even in the short term. Long-term prospects may be even better. As always, you should consult with an investment advisor or your CPA before buying. Beyond the intrinsic investment value, this is something you can really enjoy. A community of owners just like you. Who are passionate about cars or motorcycles. And who are planning to use the mezzanines in every unit to create leisure spaces with fiber-optic Internet connections and optional cable TV or personal offices where they’ll look forward to spending time with friends and associates — especially on race days or during Monterey Car Week. This just may become your home away from home. You can also contact Gordon McCall, who’s part of the development team and will be relocating his business — McCall Events — to the community upon build-out, at mccall57@aol.com or call (831) 372-9311. Or you can contact Ralph Borelli at ralph@ralphborelli.com or call (408) 521-7117.